A pride of place among the premises for worshipping during the existence of the Terezín Ghetto was held by the Jewish prayer room situated in today’s Dlouhá Street, which was discovered in the early 1990s. In terms of decoration, namely its professionally rendered murals and texts, this is unique among all the similar premises used as prayer rooms in the former Ghetto. Mass quarters in former barracks served as the most typical accommodation of the Terezin ghetto. One of these quarters in the building of the former Magdeburg barracks has been reconstructed and made open to the public. A few years ago, the Terezin Memorial acquired a new building at No. 17 Dlouha street in Terezin. There, in a former farm house of one of the typical town courtyards, is a chapel from the ghetto times with partly preserved original drawings and inscriptions on the ceiling and walls. While exploring the unused attic of the building, the remains of one of the “closets” were discovered. 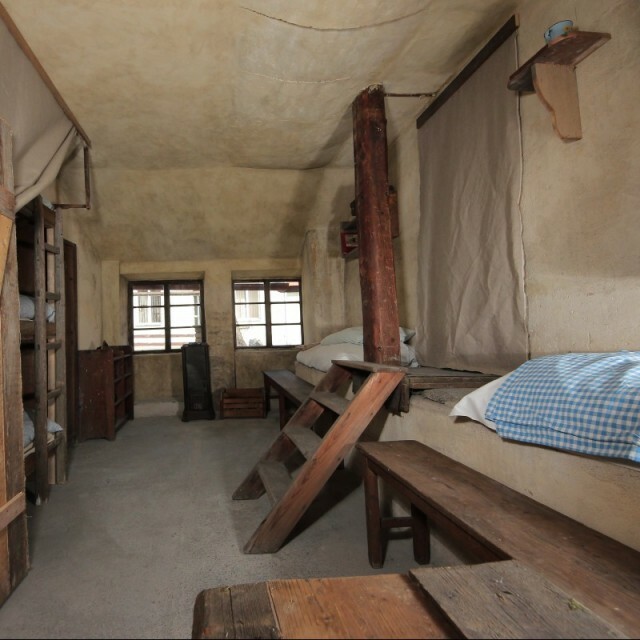 They were small rooms in the attics of residential and farm buildings in Terezin converted into emergency housings of a minimum size and providing a small group of prisoners with at least a little of privacy. In this case, it was undoubtedly a dwelling of craftsmen, who were concentrated in the building and worked in the nearby central ghetto workshops. Fortunately, this emergency residential space above the chapel was not rebuilt later on and could be turned back into a space similar to that of the ghetto times. That way visitors can get an idea about another possible accommodation in the overcrowded ghetto.